The 39th edition of the Cairo International Film Festival opened Tuesday night at El-Manara Hall in New Cairo with an extensive lineup of films and awards, but some disappointing shortcomings and disorganization on opening night. Among the highlights of the opening ceremony was the attendance of renowned English actress Elizabeth Hurley as a guest of honour. Hurley received an honourary award presented to her by the ceremony's host Asser Yassin. 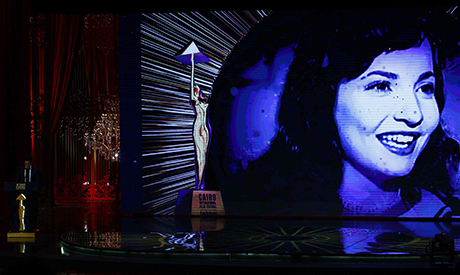 Egyptian actor Samir Ghanem was presented with the Faten Hamama Honourary Award, while the Faten Hamama Excellence Award was presented to Egyptian actor Maged El-Kedwany and to the Egypt-basedTunisian Actress Hend Sabry. Syrian singer Assala opened the ceremony with a performance of Yally Badaato Bil Fann (You Who’ve Excelled in The Arts) by iconic composer Mohamed Abdelwahab. Unfortunately the opening ceremony's start was delayed for over two hours. After the ceremony, the opening American film The Mountain Between Us began screening, after a short introduction by its Oscar-nominated Palestinian director Hany Abu Assad, who is also serving as a juror at this year's CIFF. Less than 50 viewers sat to watch The Mountain Between Us in a hall that has a capacity to seat 1500. Shortly after the screening began, Abu Assad stopped the show citing poor attendance and poor quality of projection which affected the standards he believes are needed for a screening true to the original work, a video circulating on social media showed. “I’d like to thank those who stayed, the others [who left] didn’t respect cinema, and it’s very insulting to me. Secondly the quality of the screening is very poor, this is not how I made it to be seen, and I refuse for the ‘Cairo Film Festival’ to screen my film in this quality,” Abu Assad said. At this point the video shows the few remaining guests leave. Renowned Egyptian actress Yousra, this year's Honorary President for CIFF, also issued an apology for what happened during the screening of Abou Assad's opening film, according to Al-Ahram Arabic news website reported. “[Abu Assad] is an Arab filmmaker who loves Egypt and its cinema, and was keen on showing his film in the best way, so I apologize to him for what happened with his film’s screening. Fim director Mohamed Diab, who has recently become a member of the Academy of Motion Picture and Sciences, said on his Facebook page “This is a disgrace reflecting not only on the festival but on the whole filmmaking industry in Egypt." This edition will present 175 films from 53 countries, in addition to a parallel program of special screenings and seminars. As the festival’s the guest of honour, there are 10 films from Australia, while French cinema is heavily present with 21 films, followed by 17 films from Italy. CIFF will hold screenings at Mall of Arabia Cinema, and Nile City Cinema, as well as select screenings at Odeon cinema and Zamalek Cinema. The festival’s diverse international jury for feature and documentary films is headed by veteran Egyptian actor Hussein Fahmy; the jury includes Hany Abu-Assad, Egyptian director Khairy Beshara, Syrian actress Kinda Alloush, French actress Fabienne Babe, Czech director and scriptwriter Petr Vaclav, Chinese producer and distributor Jack Lee, and Indian creative director of the Mumbai Film Festival Smitri Kiran. 17 films are competition in the section of the International Feature and Documentary films, with a selection from France, Norway, Italy, Argentina, Chile, Belgium and Slovakia. Azerbaijan South Korea, Vietnam and Tunisia. In the Horizons of New Arab Cinema competition for feature and documentary films, eight films are in competition, including two films from Syria, two from Morocco, one from each of Kuwait, Palestine, Tunisia and Lebanon. This section will be juried by Tunisian actress Rym Ben Messaoud, Egyptian DOP Ahmad El-Morsy, and Jordanian director, scriptwriter and producer Mohmoud Al-Massad. The International Critic’s Week competition for feature and documentary films will present seven films from Denmark, Iceland, Lithuania, UK, India, US and France, to be juried by Hossam Elouan from Egypt, Evangelia Kranioti from France and Abdekareem Ouakrim from Morocco. The festival’s Cinema of Tomorrow international competition for short films includes 29 shorts. In addition to three Egyptian films - All Roads Lead to Rome by Hassam Saleh Wanny, and Red Velvet by Youssef Mahmoud and Mahmoud Samir, and Something Cold by Amrosh Badr – the Cinema of Tomorrow section includes entries from Bulgaria, Estonia, Venezuela, Belgium, Kosovo, among others. CIFF’s seminars will include three different topics on three consecutive days held at the Supreme Council of Culture; ‘International Day for the Elimination of Violence against Women’ on 25 November, ‘Egyptian Film Crisis,’ on 26 November, and ‘Netflix, and the Future of Film Distribution,’ on 27 November. The New Egyptian Cinema section includes eight Egyptian films that have garnered popular and international acclaim; A Day for Women, ‘Ali, the Goat and Ibrahim’, Egyptian Jeanne D’arc, The Originals, Sheikh Jackson, Photocopy, Mawlana (The Preacher), and Withered Green. This year will see no participation of Egyptian films in competition, a first since its launch in 1976. Youssef Sherif Rizkalla, the director of CIFF, explained in a press conference on 6 November that Egyptian films did not meet the festival's requirements. There are another eight international films in the Official Selection screening Out of Competition, with several from Eastern European countries. The Festival of Festivals, which brings films that already toured and received awards in important international film festivals, includes 64 films, while 38 other films will screen under the International Panorama section. This edition will highlight New French Female Directors with a selection of six films by each of Emmanuelle Bercot, Noemie Lvovksy, Pascalle Ferran, Celine Sciamma, Justine Triet and Dominique Cabrera. With Australia as a guest of honour, the festival will present 10 films from the best of Australian Cinema, ranging between the 1979 film Mad Max, and the 2017 film Ali’s Wedding. This year's CIFF is dedicated to the renowned Egyptian actress and singer Shadia, and will honour four people the film scene has lost in the past year: Egyptian critic Samir Farid, Egyptian director Mohamed Kamel El-Kaloiuby, French director Jeanne Moreau, and French director Jean Chamoun. El-Manara Centre for New International Conferences and Exhibitions is a multipurpose edifice inaugurated by President Abdel-Fattah El-Sisi in last October at the Fifth Settlement in New Cairo. In previous years, the opening ceremony, as well as the screenings, were held at the Cairo Opera House in Zamalek, a dynamic neighborhood at the heart of Cairo. The screenings will continue at the opera in addition to Odeon cinema, Zamalek Cinema, Nile City Cinema, also located at the city centre in addition to Mall of Arabia which caters to the 6th of October City audiences.